We've had a friend from New Zealand visiting for the past couple of days, which is why this post is a little late. 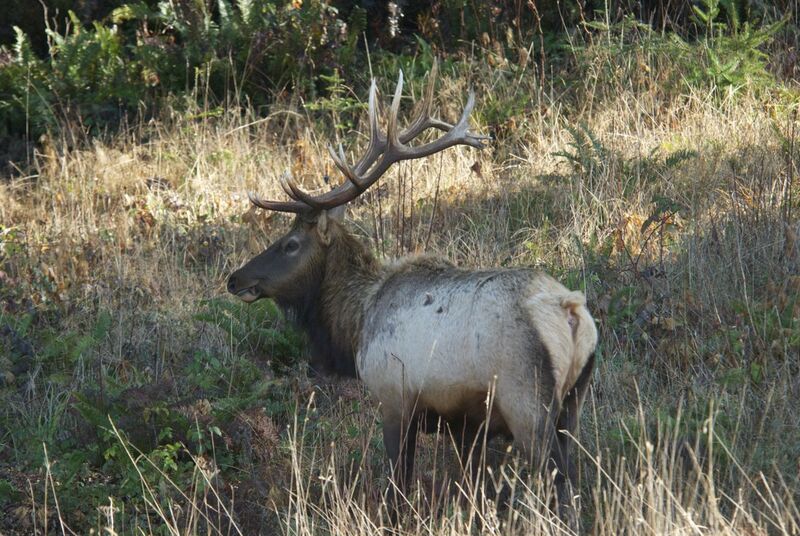 He wanted to see redwoods, but he also got an eyeful of our local Roosevelt elk, including this big bull who was grazing right next to the road in Prairie Creek State Park. It’s live! My new website is up and running! I built it on a newish application called Sandvox, which I highly recommend. Nice choices for templates, WYSIWYG interface, fast publishing of updates and good communication from the company, which is based in San Francisco. I think that artists who are looking for something beyond the cookie-cutter fine art template sites ought to check out this product. It also looks like they are very receptive to suggestions for improvements and features, so there may be an opportunity to nudge them in the direction of doing things that would make their product even more attractive to artists. I love the control I now have and, while I do pay for web-hosting, the existence of my site is not dependent on anyone else, a lesson I’ve just learned from my experience with GoDaddy after they cut off my access for 24 hours, which just coincidentally happened to coincide with the Strike Against SOPA. The fine art template sites all seem to charge for their services and besides really disliking their pedestrian template choices, who needs a monthly fee just to have a website? Sandvox costs $79.99, ok, 80 bucks. I just downloaded the latest upgrade, which was free. You can also download a free trial version to test drive it. 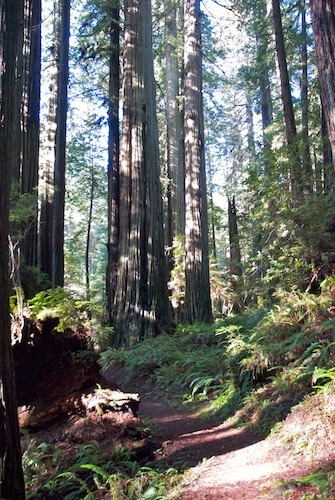 Redwoods in Prairie Creek State Park. When I was a kid I though everyone got to go camping in places like this. “What catches my eye with Susan Fox’s work, inspired by her travels to Mongolia, is her aesthetic, her craving for adventure, her way of naturalistic interpretation that reads, visually, like a beautifully-illustrated field journal. Susan’s paintings in oil speak of exotic people, animals and outposts set in a distant mythical corner of the world—an ancient kingdom synonymous with Genghis Khan, yet today a modern country surprisingly still unexplored by Western artists. Fox may be the only American animal artist who has devoted so much to Mongolia’s mountains, deserts and steppes. And that’s precisely why her work is more than decoration; it sparks conversations. Quite a review! Congratulations, Susan. You deserve it! Thanks, Bonnie! Yes, I’d asked him for an endorsement and was a little blown away at all the nice things he had to say. It was, and is, greatly appreciated! Well deserved great words from Todd….